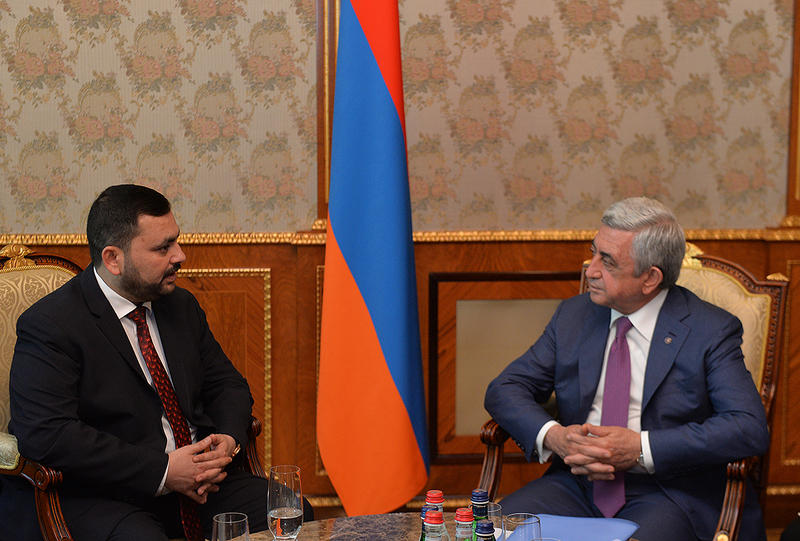 President Serzh Sargsyan received today Minister of Agriculture of the Republic of Iraq, co-chair of the Armenian-Iraqi intergovernmental commission Falah Hassan Zeidan, who arrived in Armenia to participate in the regular session of the intergovernmental commission. 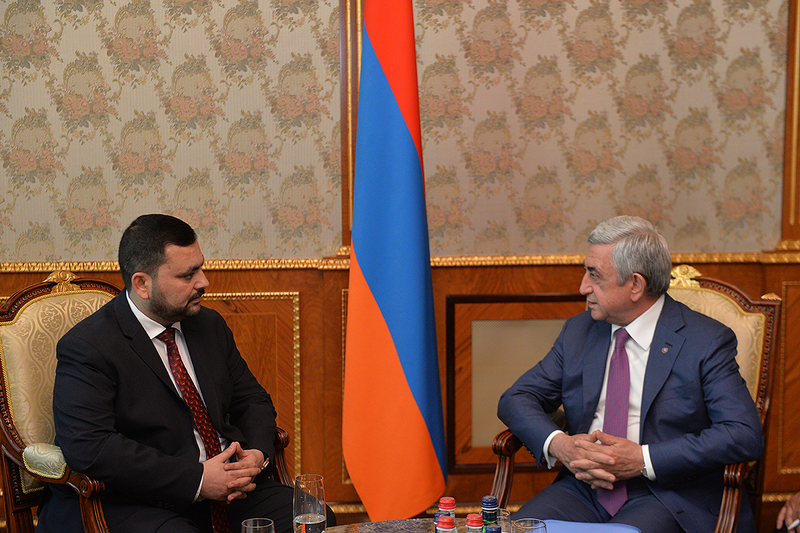 At the beginning of the meeting, the President of Armenia asked the Minister to forward warm greetings to Iraqi President Fuad Masum and Prime Minister Haider al-Abadi, assuring that Armenia has been standing by and will continue to support the fight against terrorism. Our people has not forgotten that Iraq has lovingly given shelter to many Armenian children who survived the Genocide a century ago. Now, as the global evil is destroying all the good Iraq and our Iraqi compatriots have created, Armenia can not be indifferent. The President expressed the hope that the Iraqi authorities will succeed in liberating the country from terrorists in the near future and establish full control over the country. Thankful for the reception, the Minister of Agriculture of Iraq conveyed reciprocated greetings on behalf of the President and the Prime Minister of Iraq, underlining that they wish peace and stability to Armenia and the friendly Armenian people. Minister Falah Hassan Zeidan assured that Iraq is keen to deepen relations with Armenia and went on to note that his visit could be a good start for the implementation of the agreements reached so far, as a result of which bilateral trade turnover may increase considerably. 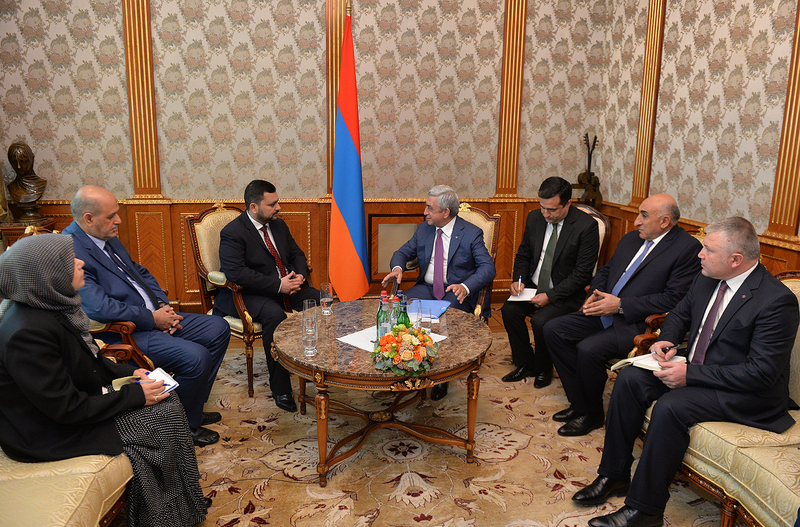 President Serzh Sargsyan and the Iraqi Minister of Agriculture highlighted the work of the intergovernmental commission. They said to be convinced that the documents signed in a number of areas of mutual interest, such as agriculture, energy, trade, education, tourism, etc., may help develop cooperation in both bilateral and multilateral formats to the benefit of the two countries and peoples.